Guyana has been urged to take the lead in the fight against stigma and discrimination in the Caribbean region by amending its Prevention of Discrimination Act to include sexual orientation, gender identity and health status. The call was made by Stephanie Joseph de Goes, Guyana’s Country Coordinator for the US President’s Emergency Plan For AIDS Relief (PEPFAR), at the 7th Annual AIDS Candlelight Memorial, held at the Catholic Life Centre by the Society Against Sexual Orientation Discrimination (SASOD) on Sunday last. “Let us work to make history in the Caribbean. Let Guyana lead the charge. Let us transform our silence into action–collective action. We are here, today, because we share a commitment to creating a world where people do not become infected with HIV, or die of AIDS or endure the dehumanisation of stigma and discrimination. Let me repeat – the dehumanisation of stigma and discrimination. We know what happens when we dehumanise one another, it breeds injustice,” Joseph de Goes was quoted as saying in a SASOD press release on the event. “We cannot afford to say, ‘we cannot support amending the Prevention of Discrimination Act because of religion, beliefs, culture, etc;’ we know what has been done in the name of belief–human atrocities and ‘man’s inhumanity to man. Will we continue to allow injustices in the name of belief and ‘difference?” she added. Joseph de Goes lamented that legal and social environments are still failing to address stigma and discrimination against those most vulnerable to HIV and people living with HIV. As a result, she urged the Guyanese society to work together for equality and recognise that denying anyone the right to justice, equity, access, security, education, health and employment is denying the right to everyone. “Let us decide to work together towards a Guyana where laws protect the human rights and the dignity of all. Guyana’s time is now. We are at the 50-year mark. Let us join forces to support the amendment of not just the 1997 Prevention of Discrimination Act but also all other punitive laws,” she said. 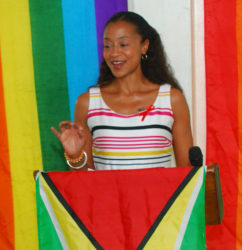 “In the next 50 years, Guyana can be a nation with zero discrimination and 100% human rights so that every person, whether HIV-positive, HIV-negative, heterosexual, homosexual or bisexual, lives in dignity with the rights to employment, health, safety and security because all lives really do matter,” she added. Joseph de Goes noted that the theme for this year’s observance, ‘to engage, educate, and empower,’ emphasised the need for each individual– not just people living with HIV or gender minorities–to join forces in the movement for human rights and zero discrimination. “We must put an end to the disease of stigma and discrimination,” she said, while emphasising that their elimination would positively affect a nation’s progress, well-being, and public health for things like HIV prevention, care and treatment.